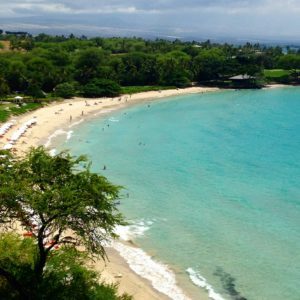 In the spring of 1960, Laurance Rockefeller went swimming at Kauna‘oa, a half-moon of sand at the edge of a roadless lava plain on the Kohala coast. He marveled at the manta rays somersaulting in the bay and the surrounding volcanoes, Mauna Kea and Mauna Loa, hunkered on the horizon. This was his first trip to Hawai‘i; Governor William Quinn had invited the grandson of oil baron John D. Rockefeller here in hopes that he’d invest in what had recently become the fiftieth state. The expedition proved fruitful. A year later Rockefeller broke ground on a resort at the site—a resort that would influence future hotel development in Hawai‘i and set a standard for style worldwide. He furnished the property with one of the most significant private collections of Asian and Oceanic art, and through his patronage injected new life into the art of Hawaiian kapa. He funded the construction of Queen Ka‘ahumanu Highway and helped restore a major heiau (temple). His efforts spread to other islands, too: On O‘ahu he fostered the development of the East-West Center, and on Maui he launched a drive to increase the size of Haleakalā National Park. His contributions to Hawai‘i continue to bear fruit. Kauna‘oa was the last beach Rockefeller visited; he spotted it from the plane. The hard-to-reach oasis belonged to Parker Ranch. Rockefeller and Mason met a small group of paniolo (cowboys) at ranch headquarters in misty Waimea and proceeded down the shadeless jeep trail to the shore. Blindingly beautiful, the site lacked nearly every necessity for development: electricity, plumbing, roads, vegetation of any kind. But it met Rockefeller’s particular criteria: It had long-term profit potential. The stark scenery could rejuvenate just about any jaded guest. And, with the sugar plantations shutting down, local residents needed work. The investor didn’t waste time. He met with ranch owner Richard Smart and signed a 99-year lease on 1,800 acres of oceanfront. Smart considered it a win-win. “It’s on land the cows don’t like but the tourists love—hot and barren,” he told People magazine. Rockefeller returned shortly with Robert Trent Jones, the world’s premier golf course designer. Jones surveyed the sunbaked lava plain and assured his boss that not only could he turn it into manicured greens, but the course’s third hole would be the most beautiful on earth. The first schema—a series of futuristic pods with open skylights—was scrapped after Rockefeller spent a night in a prototype that flooded during a typical North Kona rainstorm. Architecture firm Skidmore, Owings and Merrill came to the rescue with a mid-century modern design. At first the concrete structure appeared monolithic, but it masterfully incorporated natural light and ocean breezes. Guestrooms opened to a garden atrium, and exposed stairways connected each floor. There were no claustrophobia-inducing hallways or air conditioning, which Rockefeller loathed. Blue tile floors mirrored the ocean, the exterior paint matched the color of the Kauna‘oa sand, and a large lava rock wall on the ground floor paid homage to nearby Hawaiian heiau. The lobby featured Hawai‘i’s first retractable roof, which could close during rain showers. 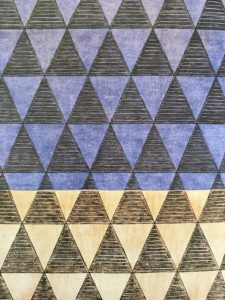 One of the Mauna Kea’s chief legacies is its remarkable art collection, an assemblage equal to any museum in the Pacific and greater than that of any other hotel. Rockefeller amassed over 1,600 original artifacts for display throughout the resort. Every foyer and alcove features a dynamic expression of creativity: lacquered horses from Edo-period Japan, bronze Burmese drums, Māori canoe prows, and wooden masks from Papua New Guinea. 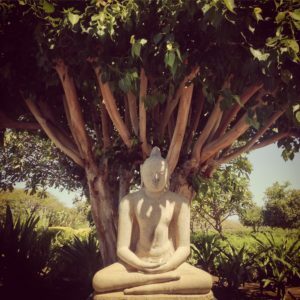 Among the most impressive is the Great Buddha, a pink granite sculpture dating back to seventh-century India. 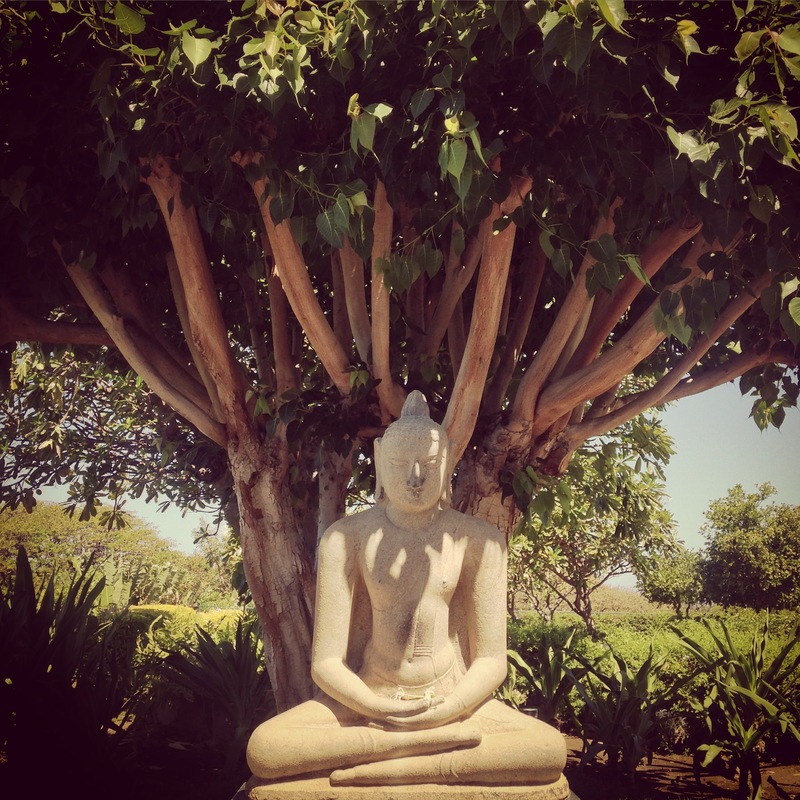 It sits in serene meditation at the top of the grand staircase beneath a bodhi tree. Rockefeller didn’t just collect antiquities; he commissioned new works from Hawaiian artists. During the hotel’s construction, he befriended the Reverend Abraham Akaka, the influential minister of Kawaiaha‘o Church in Honolulu. Akaka introduced him to Meali‘i Kalama, a church member and expert quilter, who agreed to produce thirty quilts for the resort. Hawaiian applique-style quilts are highly symbolic, thought to hold the mana (spiritual energy) of the quilter and whoever sleeps beneath. Each quilt requires over a million stitches. Kalama and a group of women sewed day and night to complete their masterpieces in advance of the hotel’s opening. 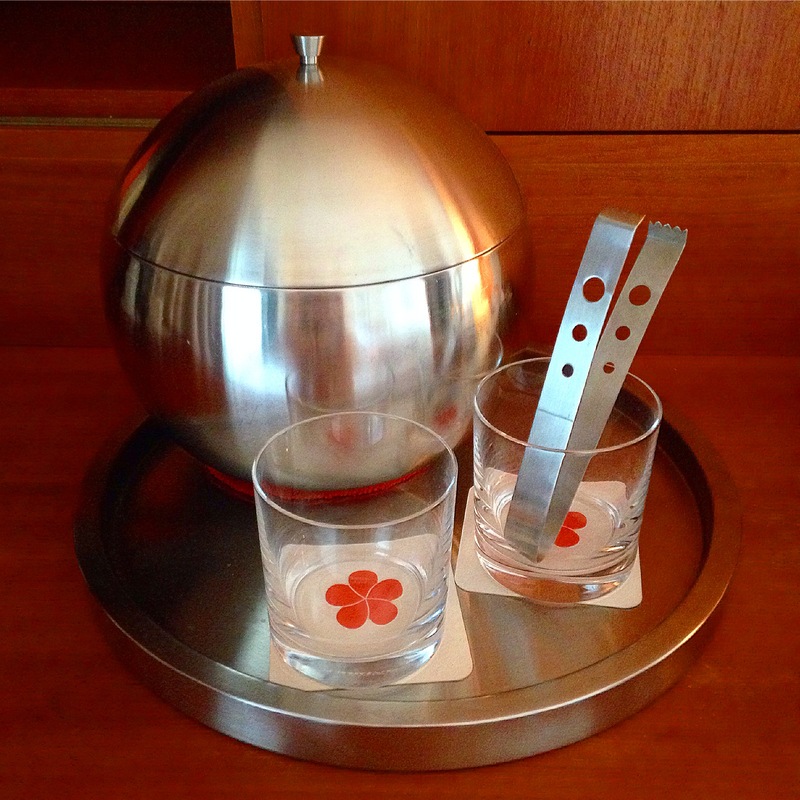 Each featured a different floral motif: hibiscus, silversword and the resort’s signature orange plumeria. The women gifted Rockefeller with an additional quilt, styled after the Hawaiian flag. Such quilts have special historic value: They signified loyalty to Queen Lili‘uokalani during the overthrow of the monarchy. 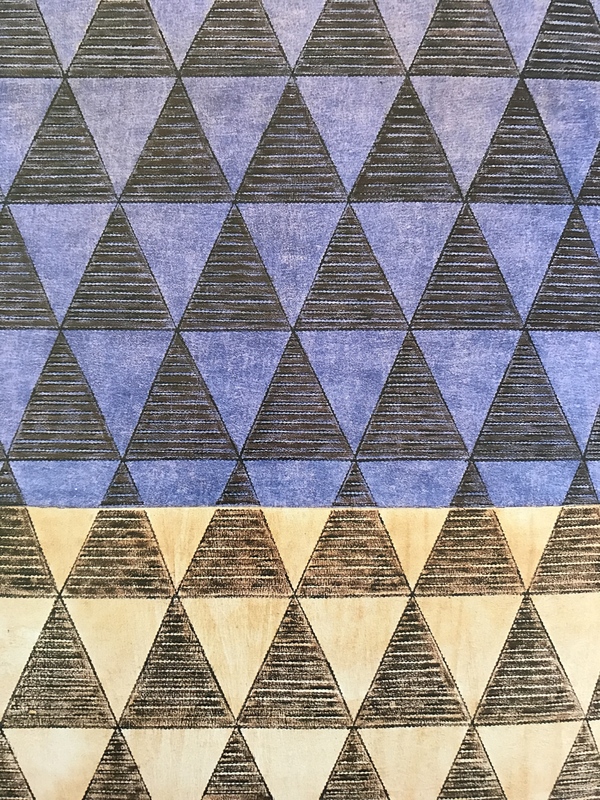 The Mauna Kea quilts represent the largest standing exhibit of this medium in the state; they can be viewed on the hotel’s seventh floor. In 1998 Rockefeller donated another fifty acres at nearby Puhilele. This spurred Pa Kui-a-Holo, a Native Hawaiian society of modern warriors, to show their appreciation. They invited Rockefeller and his family to a ceremony at Pi‘ilani Heiau, where they named him an honorary member of their group and presented him with a kīhei (cloak) and ihe (spear). Rockefeller, in turn, lauded Lindbergh’s efforts on behalf of East Maui. After the famous pilot died, his friend pledged $50,000 to help relocate the Argonaut, Lindbergh’s house, to park land where it could serve as an education center. Convinced that Hawai‘i was the logical meeting point between East and West, Rockefeller helped found the East-West Center on O‘ahu. The first major private donor, he gave close to $1.6 million to support the center’s arts and cultural activities and served five years on its board. A pioneering venture capitalist, Rockefeller leveraged his influence to bolster emerging institutions and industries. He invested in aviation, aerospace, lasers, data processing and nuclear power. 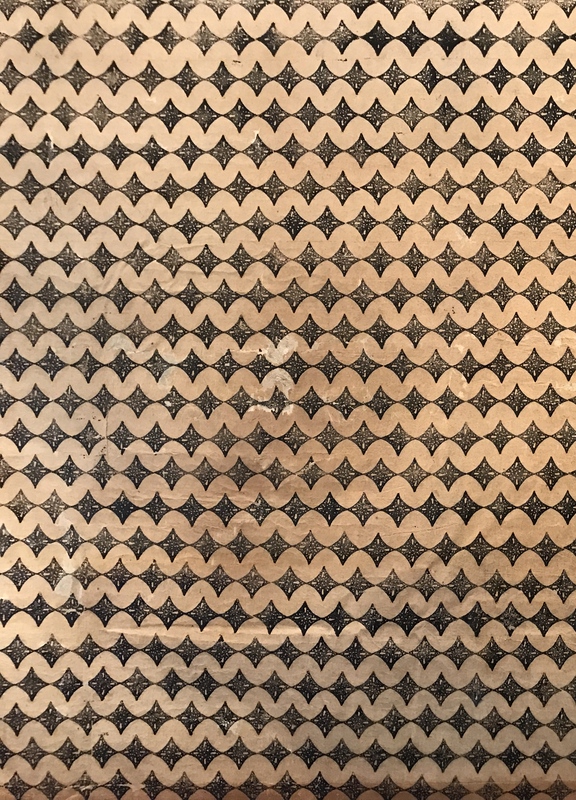 This story originally appeared in the Feb-March 2018 issue of Hana Hou! – The Hawaiian Airlines Magazine. This entry was posted in Uncategorized on April 27, 2018 by shannonAdmin. Madame Pele, the Hawaiian volcano goddess, is putting on a firework show at Kīlauea. Don’t miss it! 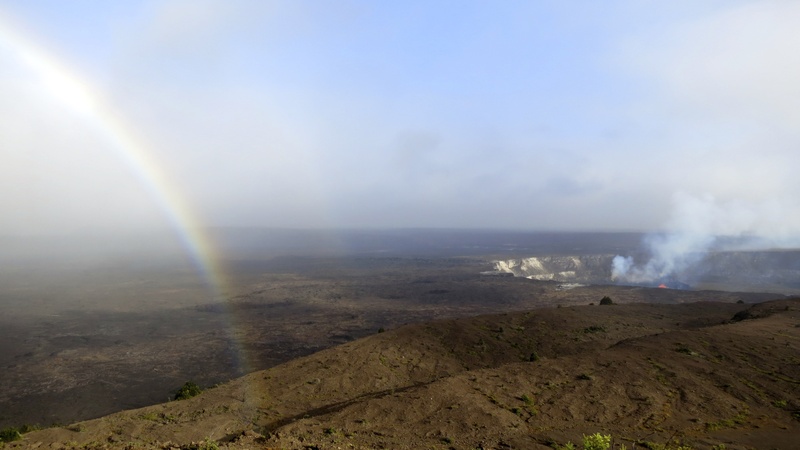 Book front row seats to the Earth’s live birth, playing now at Kīlauea. I’ve visited the volcano many times and this is one of the most spectacular eruptions I’ve ever seen. Sticky ropy fire dripping like molten syrup. Sometimes we humans need a reminder of how small we truly are in the greater scheme of things. Sometimes it feels good to feel small, powerless, and insignificant. It reminds us that the world has its own orbit, heartbeat, and order. We can’t mess it up no matter how hard we try. So many people nurture fantasies about Paris—the two-thousand-year-old “City of Lights”—that it’s as much a dream as an actual place. In the Paris of fantasy, Edith Piaf still sings, the Impressionists paint dancers beneath the windmills of Montmartre and Hemingway sits in a brasserie scribbling about bullfights. Couples kiss on the Pont Neuf, beautiful girls bicycle down the Champs-Élysées and even the dogs are fashionably coiffed, poised beside their owners in the shade of Le Tour Eiffel. The real Paris is all of this, but more: grittier, more diverse and brimming with lively contradiction. If the celebrated French capital is often mistaken for its postcards, it’s not alone. 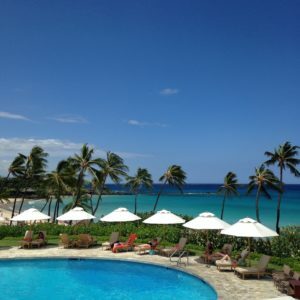 It shares that distinction with the world’s other most desirable destination: the Hawaiian Islands. Everyone dreams of escaping to Hawai‘i; few expect to explore the depth of its indigenous culture. Kilohana Silve has spent her life navigating the nuances of both paradises: Parisian and Hawaiian. She’s discovered that when they mix, magic happens. In Montparnasse, her regal carriage, commanding gaze and extra-long black mane might draw second glances; in Honolulu, they’re immediately recognized as the hallmarks of a kumu hula (hula teacher). For twenty-two years Silve has run the only hula hālau (school) in Paris, serving as a living conduit between the Old World and Oceania. She first arrived in France in 1972, a twenty-year-old art history student from Mānoa, O‘ahu. A family friend told the adventurous girl that she needed to leave Hawai‘i in order to find it. The remark proved prescient. In Paris, as anyone might’ve predicted, she fell in love. She married a handsome French sculptor and set up house in the ninth arrondissement—the home of the magnificent Opéra de Paris and former haunt of the Impressionistic painters. Silve dove into the French art world, working as a curator, critic and professor. 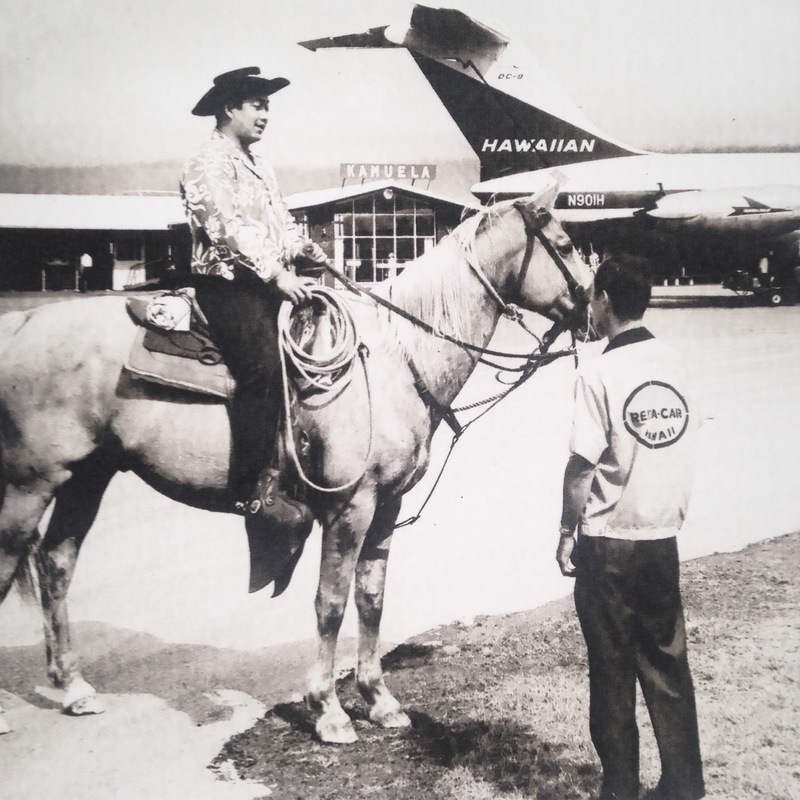 Hawai‘i was never far from her thoughts; every franc she earned she spent on airfare home. These globe-spanning trips doubled after the birth of her daughter, Vanessa Leilani Thill. When Thill was old enough to express an interest in hula, her mom—who doesn’t do things in small measure—studied up and opened Hālau Hula o Mānoa, Paris’s first hula school. In 2012, the hālau celebrated its twentieth anniversary. Rather than throw a party, Silve launched a citywide hula festival. 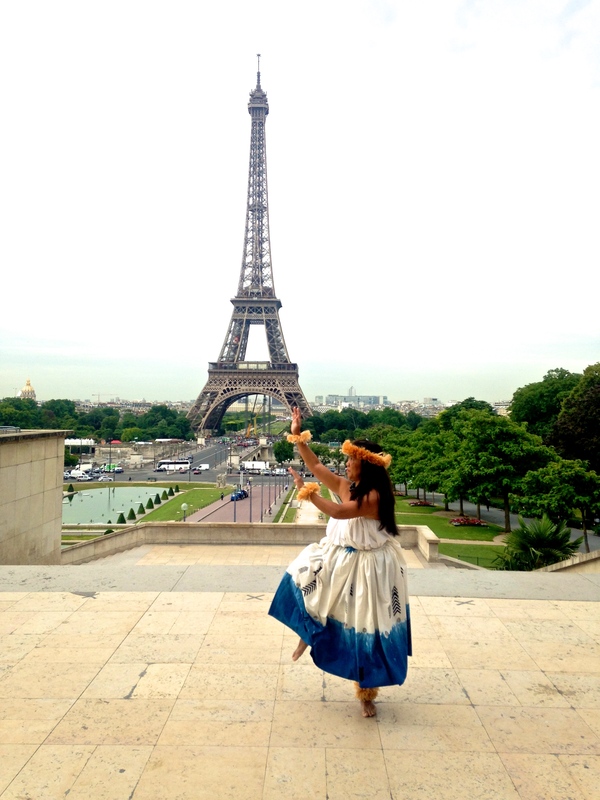 Why not, she thought, seize the opportunity to introduce Paris to traditional Hawaiian arts? Little did they know. It took time, but the Parisian kumu hula delivered the real deal. For the inaugural Festival des Arts d’Hawai‘i in 2012, Silve and Thill (who now assists her mother in running Hālau Hula o Mānoa) invited some of the most renowned Hawaiian cultural practitioners and musicians to Paris. Luminaries included slack-key guitarist Makana, ‘ukulele virtuoso Taimane Gardner, chant and protocol master Sam ‘Ohu Gon III and members of Hālau Mele, the school started by revered kumu John Lake. Silve’s running joke is “Ou va faire quelque choses de très simple”: Let’s keep it simple. Whenever she says this, her haumana (students) brace for work. Before their first big fête was finished, Hālau Hula o Mānoa began planning the next one. In June of 2014, the international team reassembled to host the second Festival des Arts d’Hawai‘i: a ten-day whirlwind of hula, ‘ukulele and slack-key guitar, lei making, seminars and storytelling. Several thousand people attended events at venues scattered around Paris. The delicious cultural exchange gave Parisians a true taste of the Islands, and visiting Hawaiians a chance to indulge in impeccable French fare. The 2014 fête began with a stirring performance of sacred Hawaiian dance at the prestigious Musée du Quai Branly. Just a few blocks from the Eiffel Tower, the Branly houses artifacts from Africa, Asia, the Americas and Oceania. It served as a perfect backdrop for hula kahiko, the Hawaiian Islands’ oldest dance form. The state-of-the-art theater filled with the sweet, unmistakable fragrance of maile, hand-carried from Hawai‘i. The Hālau Mele dancers from O‘ahu joined their French hula siblings on stage. Together they embodied the ancient stories of the Hawaiian archipelago, from the Kumulipo to the epic tale of Hi‘iakaikapoliopele. The swish of ti leaf skirts and reverberating heartbeat of the gourd drums transported the audience from central Paris to the cloud-wreathed summit of Haleakalā and the smoldering caldera of Kïlauea. Anyone who came expecting a saccharine recital of Lovely Hula Hands likely had their fuses blown. As the program progressed, the French dancers showed the caliber of their training—performing grueling seated dances and adeptly incorporating kala‘au (percussive sticks). In a show of respect, the Hawaiians brought their finery to the festival: rare māmane seed lei and hand-stamped kihei (capes) made especially for the occasion. Lucky Parisians witnessed choreography and costumes of a quality that even Hawai‘i residents rarely get to see. Outside, the sky had finally darkened after a languorous twilight. People streamed back onto the streets, shaking open umbrellas against a light summer rain. The evening’s performance might have prompted some local Parisians to wonder if this rain shower had a distinct identity and name, as so many rains in Hawai‘i do. This sensual opening night was just the beginning, the amuse-bouche of the moveable feast to come. The following afternoon, the Branly’s garden amphitheater fairly glowed with gold and red daisies, the colors of Hawaiian royalty. Vanessa Thill and Therese Multz broke open the bouquets and passed out flowers along with instruction in the art of lei-making. Young mothers helped toddlers pluck blossoms from the stems and thread them into necklaces and crowns. Elated with their creations, the normally decorous children scampered through the garden. “Très bien… maika‘i,” Thill said, encouraging a gentleman who, despite his tailored trousers, settled onto the ground to trim leaves as accents for the flower lei. Multz meanwhile demonstrated how to braid ferns together into kupe‘e, or bracelets. Wrapped around the wrist the leafy fronds acted as magic amulets, causing whoever wore them to wave their arms. Hula, it seemed, was infectious. Inside the museum, Silve and a few haumana taught an introductory Hawaiian dance class. People of all ages packed the smallish studio. With sustained enthusiasm, the novices swiveled and swayed their hips, picking up several basic movements in an hour. The twenty-five or more people who had to be turned away sat outside to watch through the floor-to-ceiling window. They could still hear and feel the vibration of the chanting, the echoing beat of the gourd drums and the pounding of the dancers’ feet. By evoking such tangible experiences of Hawaiian culture, the festival underscored the similarities between the people of Hawai‘i and France. Both tend to be romantic and obsessed with food. Both love beauty for its own sake, pay homage to history and zealously protect their native tongue. While the French formality and fussiness over manners seems the very opposite of a laidback Islander’s approach, it is mirrored by the Hawaiians’ fastidious attention to protocol. Indeed, the Hawaiian royals had little trouble assimilating to European courts when they attended Queen Victoria’s Golden Jubilee in 1887. 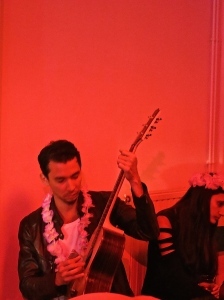 Makana referenced Hawai‘i’s history as a sovereign nation later that night during his solo slack-key guitar concert. He spoke of the long tradition of Hawaiian musicians traveling the world, sharing their innovations and techniques. Opening with a heartfelt rendition of Hi‘ilawe, the song popularized by The Descendants soundtrack, he filled the theater with rich and resplendent serenades to waterfalls and sunsets. Thill had the job of translating the guitarist’s stage banter for the French-speaking audience. The poised young woman capably interpreted on the fly, but fell speechless for a moment when Makana called her mother onto the stage. Later she confessed that seeing her mother dance hula alongside one of her favorite musicians was an unexpected gift. Back in 1992, when Silve first advertised hula lessons in the Paris Voice, she wondered: Can I really bring this culture to life so far from its roots? She had a decent foundation to build upon. As a young girl, she had learned from beloved kumu and songwriter Emma Bishop, and later from Helen Castillo and George Holokai, whose photos she still carries in her wallet. John Lake taught her oli (Hawaiian chant), and when he passed, she continued under the direction of his student Sam ‘Ohu Gon III. 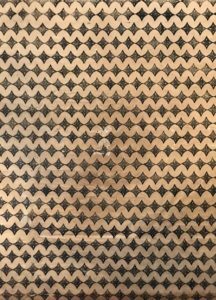 In the beginning, all of Silve’s students were expats. Most had ties to the Aloha State. Eventually native Parisians began to trickle into the studio—which begs the question: What compels a European to embrace hula? As any hālau member will tell you, it’s not just dance class. It’s a way of life. 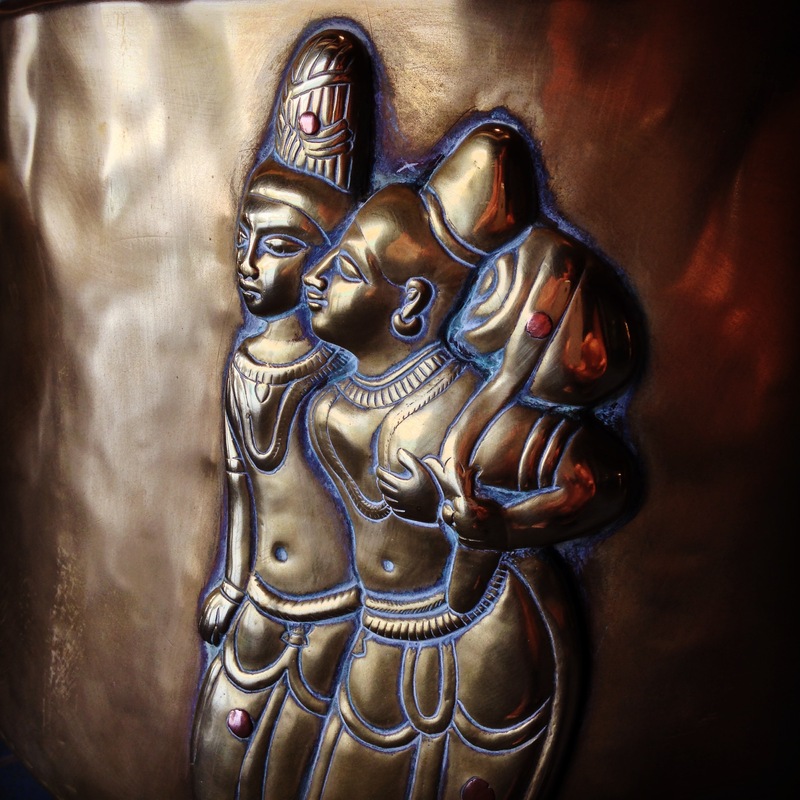 Silve’s students rattle off reasons why they’ve devoted hours, weeks and years to practicing this exotic art form: it’s great for balance and flexibility. It establishes discipline and patience. Urbanites especially crave the connection with the natural world. Probably the biggest lure is the strong sense of ‘ohana, or family, cultivated in a hālau. Nothing captures the essence of the Islands quite as much as a family lü‘au. A potluck thrown by two of Silve’s students on the third day of the festival showed that she had been successful in her aim. Paris possessed a healthy measure of aloha spirit—which isn’t so different from joie de vivre. Therese Multz and Jean-Christophe Blanchard welcomed guests from near and far into their large apartment on rue de Liege. Like Silve, Multz came to Paris decades ago to study art and gained a French husband in the bargain. The two women discovered they were neighbors and became fast friends. Eighteen years ago, Multz asked Silve to be godmother to her daughter and they became family. Hālau Hula o Mānoa often conscripts Multz and Blanchard’s home as practice space, so accomodating several dozen performers for dinner wasn’t much of a stretch. The hostess, a neo-conceptual painter, pushed her enormous canvasses against the walls and opened the windows onto the street. The balconies overflowed with flowers procured for the festival. As people poured in, they kissed cheeks French-style and touched foreheads and noses Polynesian-style. Instead of island staples like poi and poke, the massive dinner table filled up with delicacies from French markets: ripe cherries, sweet melon, Champagne, Bordeaux, baguettes, cheese and more cheese. The Hawaiians ogled a bright green wedge that owed its shocking color to fresh basil, and the heart-shaped neufchâtel, a cheese that originated in Normandy circa 1035. With plates piled high, everyone settled down for storytelling. In rapid-fire Hawaiian, chanter and slam poet Kalama Cabigon described how Pele the volcano goddess fled from the amorous attentions of Kamapua‘a, the pig god. The linguists in the audience had fun translating Cabigon’s saucy anecdotes into French and English. The stories, laughter and kanikapila (musical jams) continued late into the night. Silve and Thill had democratic aims in planning the 2014 festival. They wanted to showcase both ancient and contemporary Hawaiian art forms. They also hoped to reach people who wouldn’t necessarily go to museums or seek out Polynesian art. Thus, the jam-packed schedule hit every note, from highbrow soirées to jam sessions at indie art galleries. Sponsored by the American Embassy, nearly all of the events were free. A houseboat-turned-café on the left bank of the Seine served as the festival’s sunniest, most summery venue. From the upper and lower decks of Petit Bain, festivalgoers could watch tour boats idle down the river and colorful metro cars zip across Pont de Bercy. The day was dedicated to the ‘ukulele: starting with lessons, then an open mic session, and finishing with a sunset concert. Parisian ‘ukulele enthusiasts came dressed in their closest approximation of aloha wear: pastel shirts and flowers tucked in their hair. One stylish madame sported rockabilly gingham. She took fastidious notes and was among the first volunteers at the mic later that evening. The instructors dressed for the occasion, too. Anne-Sophie and Nathalie Coelho Da Silva wore floor-length ruffled mu‘umu‘u—the charming kind seen less and less frequently in Hawai‘i. The identical twins were eleven years old when they first heard Hawaiian music on an episode of Magnum P.I. Enchanted, they searched for its source. Sixteen years later, they found Hālau Hula o Mānoa. During their first practice with the troupe, they were thumbing through Multz’s record collection and discovered He Pua Wehiwa—the song from Magnum. They’ve been hooked on hula and Hawaiian music ever since. During their workshop, the twins taught in French but sang in Hawaiian. Their lovely, sonorous voices drifted across the river. “It was amazing,” said seventeen-year-old Louis Deville of the ‘ukulele lessons. “I learned new chords and a new strum.” The French teen initially fancied himself a guitar player, but now favors the Hawaiian instrument. “It’s easy to travel with, relaxed and beautiful,” he said. The festival afforded him his first face-to-face instruction—and a chance to perform for an audience. One by one, local songsters approached the microphone to belt out French pop tunes accompanied by sweet ‘ukulele strums. After the amateurs took their bows, Taimane Gardner rocked the houseboat with her amplified ‘ukulele. As glamorous as any chanteuse, she wowed the sunburnt crowd on the upper deck with dizzying fingerpicking. Her set ranged from Spanish serenades to rock ballads, demonstrating the versatility of the humble ‘ukulele. Downstairs, in the houseboat’s galley, chef Eric Leterc of the Pacific Club in Honolulu prepped island-style dinner specials. Waitresses whipped by with plates of ginger-steamed fish served whole. Midway through the festival, the Hawaiian contingent ventured out to Romainville, a suburb just outside the city. Thill, who lives there, said the multicultural neighborhood resembles Montmartre in the days of the Impressionists, filled with galleries and cafés, working artists and musicians. City outskirts are often were the action happens; certainly that proved true on this occasion. Alain Robak, who couldn’t have been happier to host the out-of-towners, opened up his cooperative art gallery and performance space, Laro Café, for a Hawaiian music night. Fifteen years ago, while shopping at Tower Records in San Francisco, he found an album featuring 1930s lap steel guitar—the kind popularized in the Islands. He never played a regular guitar again. On this night his rockin’ steel guitar riffs dazzled the audience. Next Makana and Taimane played together, along with Chuck Tilton, a Honolulu musician and chanter with Hālau Mele. But the evening’s wild card was a local violinist who had showed up after reading about the gathering on Facebook. He introduced himself simply as Aurélien. The newly acquainted musicians exchanged nods and began trading musical phrases: fancy fiddling for fingerpicking. They discovered they shared a common language. With eyes fixed on one another and fingers flying across their various stringed instruments, they dared each other to ever more creative heights, building to a thrilling crescendo. The aspiring musicians in the crowd soaked up every note. Before anyone knew it, night had surrendered to morning. Trains don’t reach Romainville and even the buses had stopping running. The Hawaiians poured themselves into petite French cabs and headed back into the city. The festival’s round-the-clock schedule required tremendous stamina on the part of the performers. But in between curtain calls, the visiting Hawaiians managed to drink in Paris in big gulps. Their Francophone hosts showed them how to navigate the labyrinthine Metro, order French coffee and crepes and wear scarves no matter the weather. Wide-eyed with cameras whirring, they followed Silve on a tour of Monet’s garden at Giverny. Her knowledge of Impressionistic art proved as extensive as her hula expertise. Regrettably Monet’s studio and famous water lily ponds could hardly be seen past the throngs of tourists, but Silve knew of a quieter spot. At the far end of the quaint French village, a cemetery and church dating back to the Middle Ages retained a perfect solitude. Monet is buried there, under a profusion of flowers. The Hawaiians said a pule (prayer) above his grave and then took a peek inside the sanctuary. Two swallows swooped down and out from their perch within the vaulted chamber. In the Islands, these winged emissaries might have been regarded as ‘aumakua, or ancestral spirits. A trip to the Palace of Versailles yielded similar moments of serendipity. 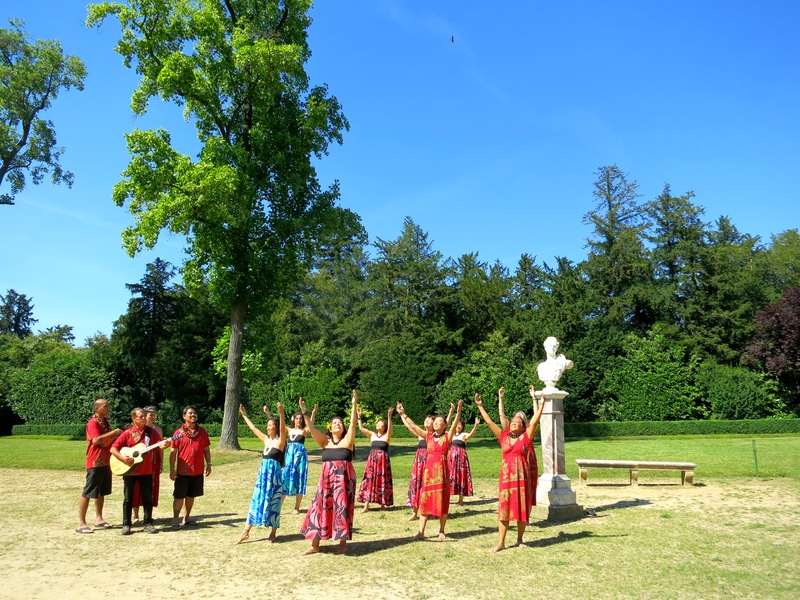 The US Embassy had invited the French-Hawaiian troupe to perform for diplomats on the palace grounds. Barefoot and dressed in bold floral prints, the dancers compelled the dignitaries to stand, sway and ultimately join in singing ‘Ōiwi E, a rousing piece composed by John Lake. After this cultural coup, the dancers rewarded themselves with an exquisite lunch at La Petite Venise, a restaurant occupying the former palace stables. Silve led the group out through the palace’s maze of perfectly trimmed hedges. They stopped once to dance just for fun—a sort of hula flash mob. A small crowd collected around them. In truth, the Hawaiians drew attention everywhere they went, distinguished by their colorful attire, distinctive lei and bright smiles. Early one morning they visited the Trocadero—one of the most popular sightseeing spots in Paris—in full costume. A Japanese wedding party nearly disbanded when groomsmen ditched their posts to snap a few photos of the Hawaiian men dressed in malo (loincloths). Even the locals, who yawn over the most inconceivable fashions on the haute couture catwalks, did double takes. For the final Soirée Hawaienne, Silve booked the Maison du Cultures du Monde—the same institution that had pooh-poohed Hawaiian art so long ago. Here, the French and Hawaiian performers pulled out all the stops. First, Sam ‘Ohu Gon III presented an astounding audio-visual collage accentuated by live performance. Incorporating spectacular photography, ancient chants and historic relics borrowed from Bishop Museum, he illuminated the vital connection between hula and the native ecosystems of Hawai‘i. Birdsong ricocheted through the theater. Images of scarlet honeycreepers flashed across a massive screen while a dancer brought the rare forest species to life. Overcome by the presentation, audience members expressed deep gratitude for the vicarious trip to the Pacific. Their reeducation was complete. Later that night, all smiles, the ensemble performed a selection of contemporary hula. A dozen dancers took to the stage for the finale, done to Edith Piaf’s classic love song, “La Vie en Rose.” Dancing hula to the famous lyrics, they sang them first in French, then in English, then in Hawaiian. The hypnotic refrain talks of a lover’s embrace and seeing life in rosy hues—something people of both cultures can relate to. At the song’s end, the Parisians shouted a Hawaiian phrase they now knew by heart: Hana hou! Encore! This entry was posted in Uncategorized on December 5, 2014 by shannonAdmin. The scent hit me the minute I stepped out of my car. Beneath the hot sugar of malassadas frying inside the Punalu‘u Bake Shop, I caught a more sultry fragrance…woodsy, hypnotic and unmistakable. He didn’t have business cards and wouldn’t share his phone number. When I asked where the sandalwood came from, he told me he’d felled it on his own ten acres in nearby Miloli‘i, bucked it with a chainsaw and hauled it out piece by piece. He was friendly and full of facts about this rare Hawaiian hardwood. What he was doing was perfectly legal, but I couldn’t shake the feeling that I’d stumbled across something illicit, like rhinoceros horn or turtle meat. “Sandalwood” and “sustainable” are words not often paired. For thousands of years, spiritual aspirants in the Far East have used sandalwood as a bridge to the divine. To this day, Hindus smear fragrant sandalwood paste onto their foreheads before meditating. Buddhists count prayers on sandalwood beads. Carvers turn the soft, sweet-smelling wood into cabinets, toys and sacred statues. Ayurvedic doctors prescribe sandalwood oil to cure skin conditions, while the Kama Sutra praises its aphrodisiac powers. Sandalwood is reputed for both calming passions and stirring them. In Hawai‘i, it has mostly done the latter. The world’s most coveted sandalwood species, Santalum album, comes from India, but there are other sandalwood species, native to Australia, Fiji, Indonesia and Hawai‘i. In fact, the Hawaiian archipelago is home to six sandalwood species—all of which occur nowhere else on earth—representing a third of the genus’ diversity. Santalum trees produce santalols, powerful compounds responsible for the wood’s potent aroma and medicinal properties. But santalols are only present in the heartwood—not the bark or leaves. To get a whiff, you must sacrifice the tree. Therein lies the trouble. Throughout the tropics, the sandalwood industry has been marked by greedy overconsumption and outright theft. To satisfy insatiable international demand, Indonesia and Sri Lanka wiped out their native sandalwood forests. The world’s biggest suppliers, India and Australia, battle poachers; thieves pinched as much as 90 percent of India’s harvest in 2012. But nowhere has the sandalwood trade so deeply affected the community as in Hawai‘i. When Captain James Kendrick anchored the Lady Washington off of Kaua‘i in 1791, he found Hawaiians perfuming kapa (barkcloth) with shavings from the ‘iliahi tree. The American privateer immediately recognized ‘iliahi as sandalwood—a hot commodity in China. Kendrick set three sailors ashore to collect as much wood as they could find. At first, Chinese merchants rejected Hawaiian sandalwood as inferior. But by 1805, shipments of ‘iliahi were turning significant profits in Canton. Sandalwood became the Islands’ first major export. The trade—which lasted just thirty years—was swift and devastating for the forest and people of Hawai‘i. At the time of Western contact, the Hawaiian ali‘i (chiefs) were at war. Kamehameha I, who was then rising in power, established a monopoly on sandalwood. The abundant natural resource gave him the means to purchase ships, cannons and guns. This new currency ushered in an era of commerce that unraveled the Hawaiians’ centuries-old subsistence lifestyle. Traders measured sandalwood in piculs, equal to 133.3 pounds—the weight a man could carry. A picul of sandalwood fetched an average of $10 in China, in an era when a dollar bought fifty pounds of beef or four hundred pounds of sweet potatoes. During the height of the sandalwood trade, historians estimate that Hawaiian men hefted at least one hundred thousand piculs of lumber out of the mountains. Sandalwood harvesters were nicknamed kua leho (callous back) after the callouses they developed from hauling logs down from the mountain. They dug pits in the forest the size of ship’s hulls to measure what they needed to harvest. A few of these lua moku ‘iliahi (sandalwood pits) remain as testament to bygone forests, one in Kamiloloa on Moloka‘i and another on the Kapalama Nu‘uanu ridge on O‘ahu. By 1810, Kamehameha had successfully vanquished his foes and united the Islands under single rule. According to Native Hawaiian historian Samuel Kamakau, when the king saw that his people were suffering from famine, he ordered the sandalwood harvesters to return to their farms and fishponds. He placed a kapu (restriction) on young sandalwoods to allow the forest to regenerate. After King Kamehameha died in 1819, his son and successor, Liholiho, was ill prepared for his new role as monarch. The boy had led a sheltered life of luxury, gaining a reputation as a gambler and drinker. He cancelled the kapu on sandalwood and allowed other ali‘i to trade, which proved disastrous. Hawaiian royals bought frame houses, silks, liquors and other extravagances using credit, an utterly foreign concept. Receipts show $800 promised for a mirror and $10,000 for a brass cannon. By 1826, the monarchy’s debts surpassed $200,000. Two American warships visited the Islands to investigate the situation. This prompted the Kingdom of Hawai‘i to enact its first written law. The Sandalwood Tax required every Hawaiian man to provide a half picul of sandalwood or pay four Spanish dollars. (He was allowed to keep a half picul for himself.) Women were obligated to deliver twelve-foot lengths of kapa. The debts weren’t settled until 1843. Many did perish, but not due solely to the sandalwood trade. During the decades following Western contact, hundreds of thousands of Hawaiians died from introduced diseases. As the villages emptied, so did the forests. By 1840, the sandalwood supply was exhausted. Meanwhile, the rapacious sea captains found a new target: whales. Hawaiian sandalwood faded from the collective consciousness over the ensuing years. The once-prized trees grew so rare that many Islanders came to believe they were extinct. They are not. 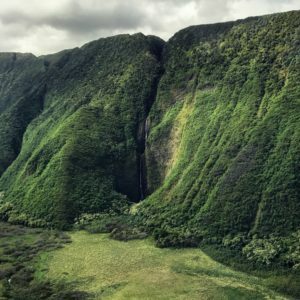 Though the world has forgotten them, the majestic trees still exist, and on one Hawaiian hillside they exist in great number. But these grey-barked sentries are dying, struck by fire, drought, sheep, rats—and, once again, humans intent on harvesting them. 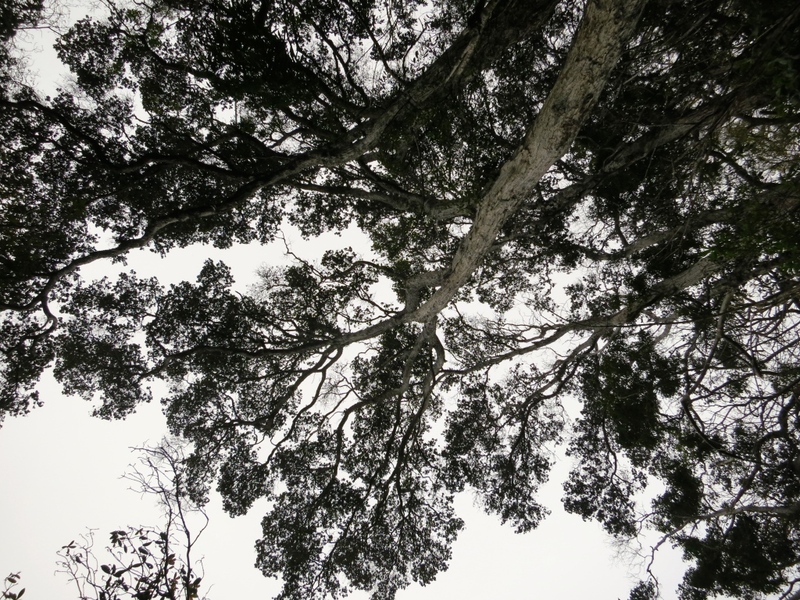 If the elder trees go, will another generation of ‘iliahi take root in the Islands? If you know what to look for, you’ll find sandalwoods scattered throughout Hawai‘i. The trees have bluish, almost jadeite green leaves and clusters of miniscule, star-shaped flowers. Each of the main Hawaiian Islands has its own species. Kaua‘i, the oldest island, has two: the red-flowered Santalum pyrularium and S. involutum. On O‘ahu, the windswept ridges of Wai‘anae are home to a few old S. freycinetianum trees, while the rare and stately S. Haleakalae populates small pockets of forest on Maui, Moloka‘i and Lāna‘i. 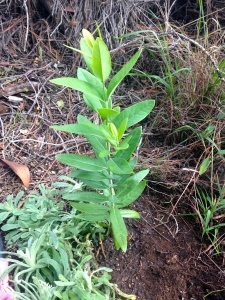 Coastal sandalwood, or ‘iliahi alo‘e (S. ellipticum), is a smaller, shrubbier species found at low elevation on all of the main islands. But the archipelago’s largest and most abundant sandalwoods inhabit its youngest volcano: Hawai‘i. High above the glittering waters of South Kona, reaching up the slope of Mauna Loa, is a wide swath of land marked on a 1905 territorial map as Sandalwood Forest. It’s the home of S. paniculatum, the fragrant, green-flowered species endemic to the Big Island. Kamehameha Schools, the largest private landowner in Hawai‘i, owns 120,000 mauka (mountainside) acres from Kealakekua north to Pohakuloa; this includes the bulk of the historic sandalwood forest. When I ask to visit, Kamehameha Schools sends along its entire natural resource management team: five people, including two managers from O‘ahu. I expect suits; instead I am met with young, fresh faces. Ecologist Nāmaka Whitehead gives me the lay of the land as we rumble up the mountain. Tropical foliage gives way to the distinctive shape of the Hawaiian dry forest: spindly, thick-barked trees that have evolved to maximize moisture. Plants in this parched terrain rely on lilinoe, fine mist, rather than rain—though at near 6,000 feet in elevation, snow flurries aren’t unheard of. Today it’s sunny and clear, the summits of Hualālai and Mauna Kea visible in the distance. Before long we’re standing in the world’s largest, most intact ‘iliahi forest. Towering koa trees cast lacy shadows on the hard lava plain. Yellow-blossomed māmane dangle twisted pods bursting with neon orange seeds. Growing amidst this bounty are more sandalwoods than I can count. I press my nose up to their flowers. A flirtatious elepaio chatters from the canopy of the tallest ‘iliahi I’ve ever seen. While Santalum species typically top out at thirty feet in height, the S. paniculatum here approach sixty-five. We sit down for a picnic in this idyll. Whitehead explains that the seeming paradise is fraught with problems. “The last few years, the droughts have been longer and more severe. The plants up here are adapted to dry conditions but not this dry.” Climate change is further weakening an already embattled ecosystem. For over a century this mountainside has been grazed to a nub by cattle, sheep, and pigs—the bane of native Hawaiian forests. Even as we sit talking, a caramel tide of feral sheep disappears around the bend, their bellies likely full of tender plant shoots. Kamehameha Schools hasn’t always been the best steward of the land. The new guard seeks to change that. They’re partnering with the Three Mountain Alliance and Silversword Foundation to fence ten thousand acres and remove the animals. So far they’ve fenced a six thousand-acre parcel called Lupea. 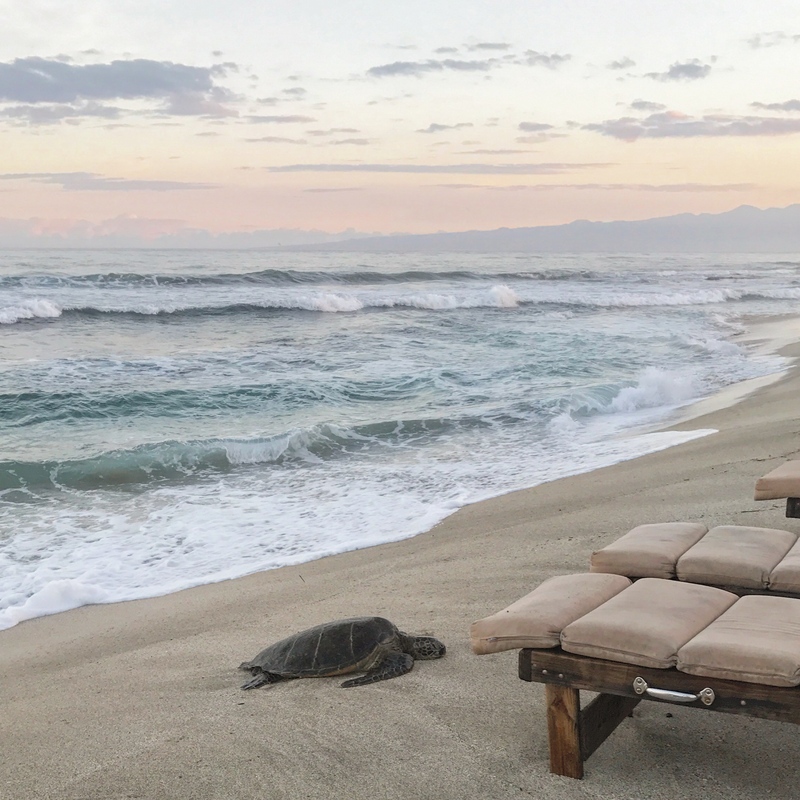 “We recognize that healthy functioning ecosystems are a vital component of the Hawaiian lifestyle and wellbeing. Without them, we lose our identity,” says Whitehead. “I Hawai‘i no na Hawai‘i i ka ‘äina: We are who we are because of the land.” The 34-year-old grew up in South Kona. Her parents taught her the many uses of native plants as a child—including how to roast and eat sandalwood nuts. “They taste like a cross between a macadamia nut and a coconut,” she says. The Kamehameha Schools team believes that the preservation of rare forest species can’t be a hobby or an academic pursuit—it has to be integral to people’s survival. To that end, the team employs not just an ecologist but also a forester, Kama Dancil. They’re looking for a model that blends restoration with commercial opportunities. Wade and Jeff Lee are Kamehameha Schools’ neighbors; they purchased 2,800 acres of forest adjacent to Lupea in 2010. As soon as the ink on the deed was dry, the brothers began felling sandalwoods and selling the timber to China, Dubai and Sri Lanka. It’s likely the largest scale sandalwood harvest Hawai‘i has seen in two centuries. Over the last four years, the Lees’ company, Haloa ‘Aina, has shipped out a thousand metric tons of sandalwood. 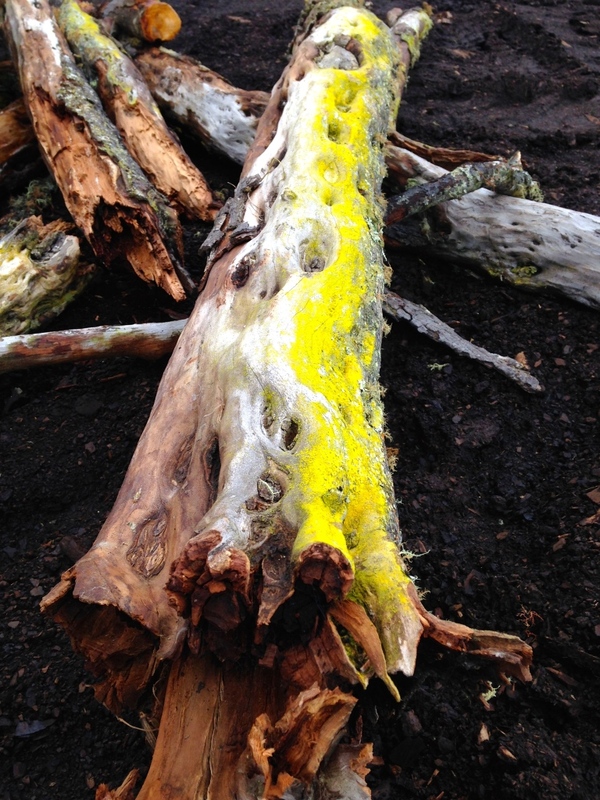 Wade Lee estimates that there’s another 3,579 tons of living and dead wood on the property. On a tour of the site, I can smell the production shed before we reach it: the air is perfumed with a haunting blend of sweet wood and diesel fuel. Shaved, pinkish logs are stacked outside the open-air shed. 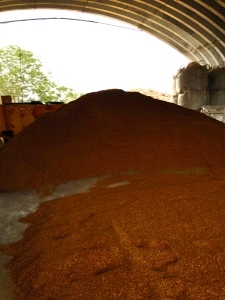 Inside, heaps of fragrant sawdust surround a giant distillation tank. The Lees use every bit of each sandalwood tree. The santalol-rich roots and heartwood are processed into essential oil: the highest value product. Haloa ‘Aina also sells hydrosol, carving logs, sapwood and powder. Even spent chips, wood that’s been processed for oil, is sold to soap and incense makers. 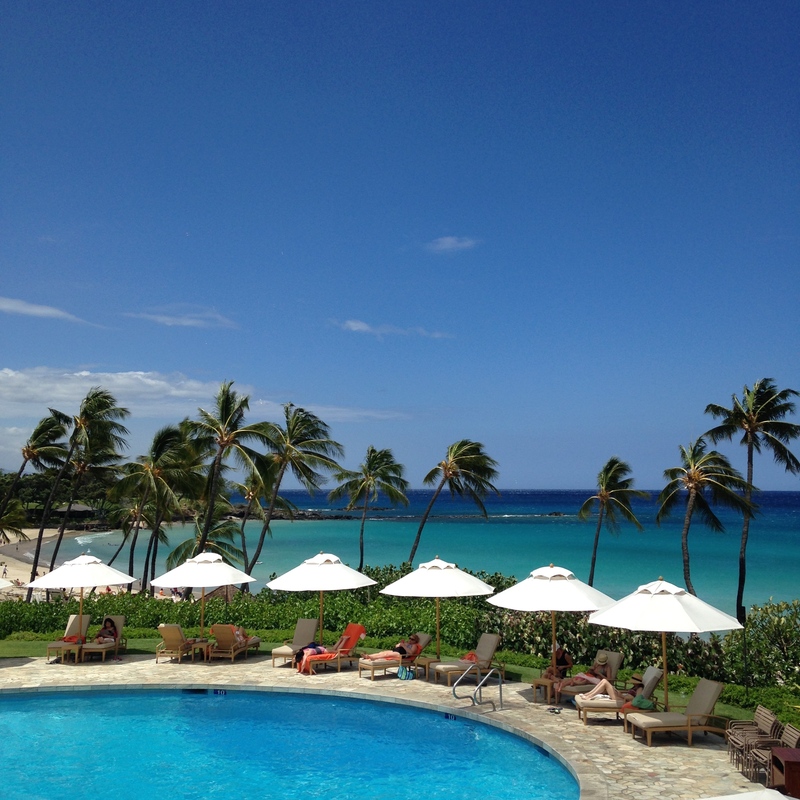 The Four Seasons Resort Hualālai just a few miles down the coast uses Haloa ‘Aina’s powder in spa treatments. Floracopeia and DoTerra buy the oil. But Aura Cacia, the nation’s largest essential oil company, won’t do business with Haloa ‘Aina. Its parent company Frontier Co-op can’t yet determine whether the Lees’ harvesting practices will support the tree’s long-term survival. Frontier Co-op’s researcher, Tim Blakley, says basic questions about Hawaiian sandalwood’s history and life cycle haven’t been answered. First, what is its natural population density? How many trees currently exist? 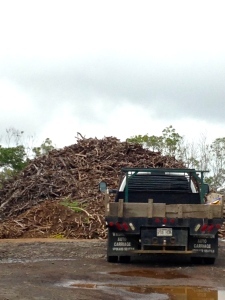 What level of harvest can a healthy ‘iliahi forest sustain? Without data-backed answers to those questions, Blakley says, the fledgling industry is operating in the dark. The question marks haven’t deterred Kamehameha Schools, though. It recently partnered with the Lees to conduct small-scale harvest trials on two hundred acres. The Lees maintain that the goal of Haloa ‘Aina isn’t logging, but reforestation. They claim to harvest only dead and dying sandalwoods, of which there are many. Wild ungulates have decimated the forest understory here too, and the trees are stressed by drought: In the 1960s, this area received almost fifty inches of rain per year; now it ekes by with just twenty-four. Fire is a constant threat. A weeks-long wildfire scorched this mountainside in 2010. The scent of burning sandalwood was intoxicating—and excruciating to those recognized it. Wade Lee’s first priority as landowner was to install fire extinguishers on every half-acre. The brothers haven’t finished fencing the property, but they have made a dent in the population of grazing animals. Once the acreage is fully fenced and ungulate-free, koa and māmane will regenerate, but the sandalwoods won’t. Their fleshy, purple fruits are candy to rats, which devour the seeds before they can hit the ground and germinate. 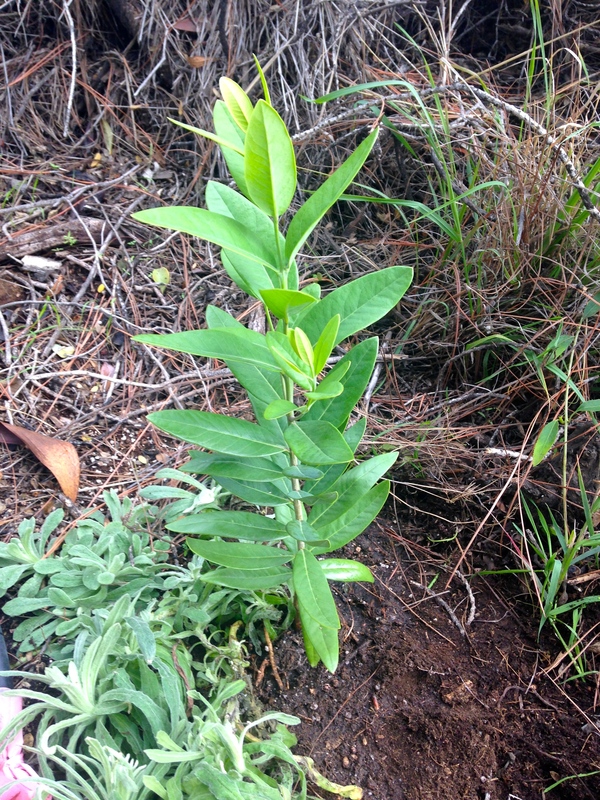 Haloa ‘Aina compensates for the rats by out-planting sandalwoods and other native seedlings grown in their nursery. But their reforestation plan relies primarily on coppicing—reproduction through root shoots. When sandalwoods are harvested, the entire tree is yanked out, including its root ball. Root fragments remaining in the soil send up shoots and become new trees. Everywhere I looked at Haloa ‘Aina, blue plastic tubes poked out of the earth at odd angles, giving the reclaimed pasture the appearance of an acupuncture patient. Designed to boost water capture, fend off sheep and diffuse UV light, these Blue-X sheaths swaddle young sandalwoods. At $3 apiece, they’re a hefty investment. Haloa ‘Aina’s underlying goal, says Wade, is to demonstrate that sustainable forestry can, in part, replace the cattle ranching that now dominates the Big Island’s landscape. “By offering a lucrative alternative,” he says, “we can grow our native forest back.” But the hitch with sandalwood’s sustainability is its slow growth. The oldest trees have the sweetest heartwood. Indian and Australian sandalwoods are harvested at around twenty years of age; older is preferable. Those planting sandalwood today won’t reap the rewards of their work; they’re planting for future generations. Under current law, Hawaiian sandalwood—the equivalent of gold on the arboreal world market—is no different from any other tree. You may knock it down to build your house (as many Big Island residents unknowingly do), you can carve it into letter openers to sell at farmers’ markets, or you can ship containers of it to Dubai. Blakley thinks the native tree should be managed under the Convention on International Trade in Endangered Species of Wild Fauna and Flora (CITES)—a possibility the Lees strenuously object to, as it would dramatically restrict their enterprise. Without the cash flow that sandalwood sales provide, Wade Lee argues that Haloa ‘Aina couldn’t afford its restoration efforts. For that reason, the Lees also object to local legislation in the works. Leigh-Wai Doo, a former Honolulu city councilman, has been working hard to pass a bill that would monitor and restrict the harvest of ‘iliahi. The current version would create a task force to study Hawaiian sandalwood and make recommendations for its statewide management. Mark Hanson, a.k.a. 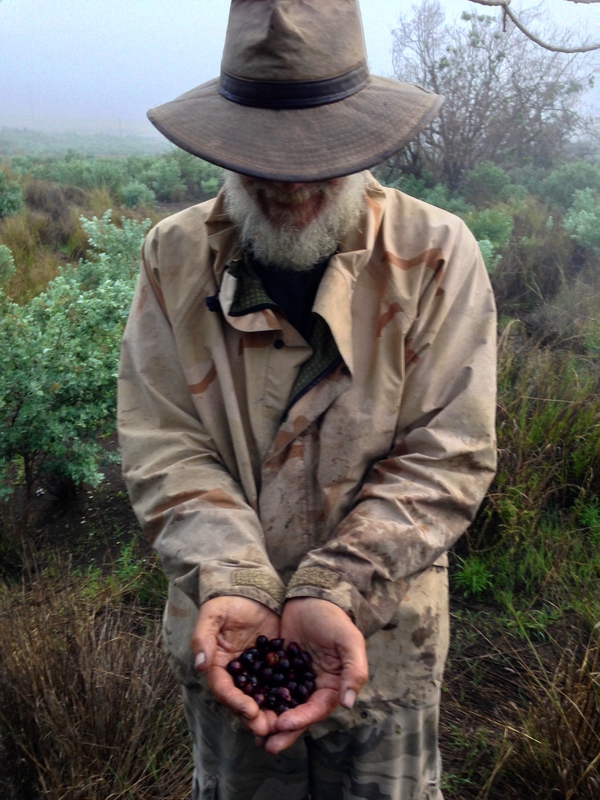 “Sandalwood Man,” collects native Hawaiian sandalwood seeds. Hanson first learned about ‘iliahi after moving to Maui from Milwaukie in 1979. The 20-year-old went on a Sierra Club hike in Haleakalä National Park, where he heard about sandalwood’s sad history. An inner voice whispered that he would one day replant the pillaged forests. In the meantime, he worked as George Harrison’s gardener in Nahiku, got married and did a stint in the military. But that intuitive voice returned, along with a few opportunities. In 1995, Hanson started the non-profit Hawaiian Reforestation Program. State forester Bob Hobdy gave him permission to collect S. Haleakalae seeds from trees at Polipoli State Forest on Maui. Rene Sylva—a beloved Hawaiian botanist and another self-taught maverick—showed Hanson how to propagate the finicky plant. Sandalwoods are tricky to grow. They can take anywhere from three months to three years to sprout. They need hosts; they’re semi-parasitic and fasten their roots onto those of neighboring plants to draw nutrients. Hanson, who now lives in Volcano, is one of few growers to have real luck with ‘iliahi. He’s been successfully germinating seedlings as long or longer than anybody else. 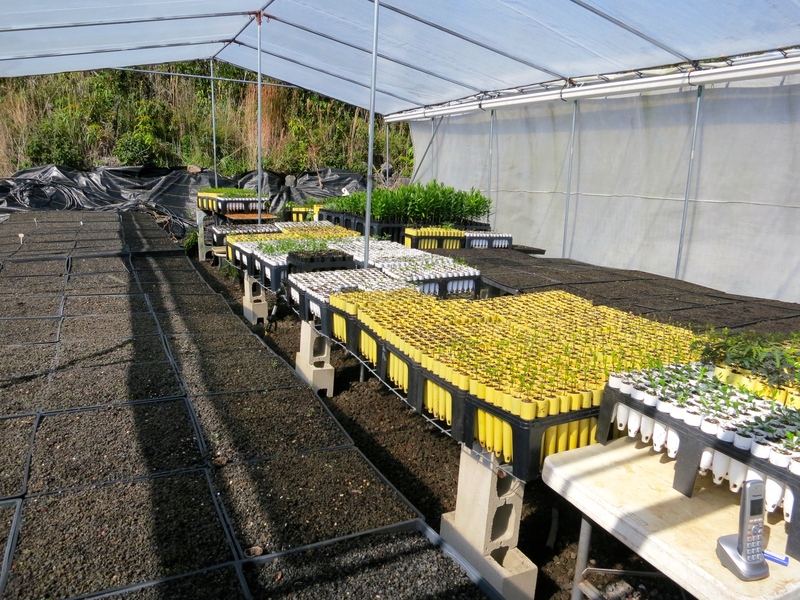 His nursery is a tidy green factory flush with native saplings, sprouted from seeds he collected in the wild. He grows sandalwoods by the thousands, but feels frustrated when he finds no safe place to plant them. “I’m the father of a homeless forest,” he says. Sandalwood saplings crowd Mark Hanson’s nursery; he’s one of the few growers to successfully germinate the native Hawaiian tree from seed. I meet Hanson at Mauna Kea State Park on lonely Saddle Road. At one time, this near desert was mixed dry forest, populated by naio, māmane and ‘iliahi trees. Sheep and goats changed that. Bitten hard by ensuing drought, the park’s sole vegetation now consists of a few bent and gnarled naio trees. Their blackened leaves are wasted by thrips, a new invasive pest. I follow Hanson to a fenced area behind the campground. Since 2007, he and some Eagle Scouts have nurtured a 33,000-square-foot patch of native forest. It’s thriving thanks to the fence and a little extra water. Inside, Hanson points out a rare fern, Asplenium fragile, growing amidst the aweoweo shrubs and blooming māmane. He hands me a leafy sandalwood sapling with instructions to plant it beside a māmane, which will serve as its host. I tamp down the soil around my sapling and douse it with water. The state has done a horrific job of safeguarding sandalwood trees—not that anybody in particular is to blame. The landscape is immense, funding shrinks year after year, and public objection to killing sheep is strident. As Susan Leopold says, if you’re hoping to protect a rare Hawaiian plant, get in line. Dozens of species desperately need management. 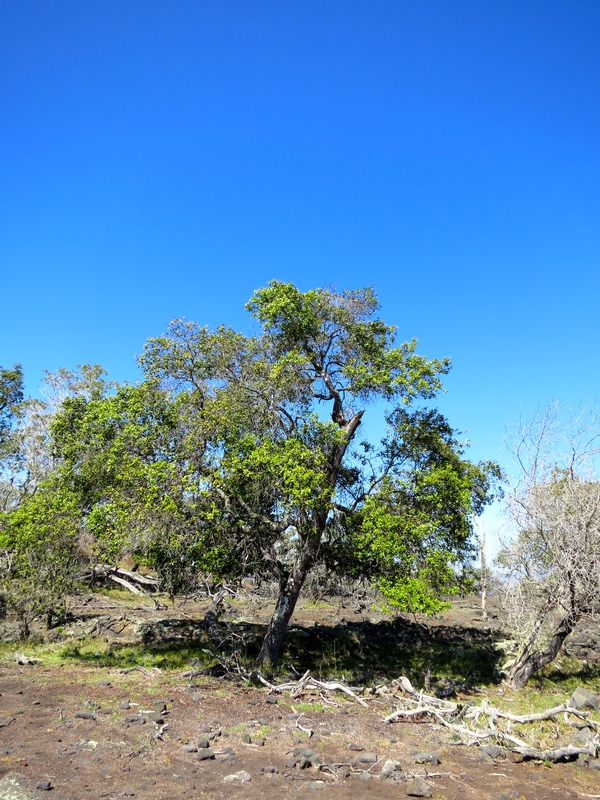 In 2012, the University of Hawai‘i hired Hanson to survey public land on Mauna Kea for sandalwood. He found only two hundred trees on Department of Land and Natural Resources acreage, and another eighty-seven on property belonging to the Department of Hawaiian Home Lands. He’s now working with both Departments to encircle the mountain with sandalwood seedlings. He also has an agreement with Kuka‘iau Ranch in Hāmākua to plant ‘iliahi on 4,500 acres, helping fulfill the ranch’s conservation easement requirements. Hanson may not have land of his own, but he’s getting sandalwoods in the ground. Hanson was among the presenters at the recent International Sandalwood Symposium held on O‘ahu in 2012. He was there to pitch his grand idea: sandalwood nuts. The Australians are already marketing the tasty fruit of their Santalum tree. Hanson claims that this renewable resource will yield far more income than the tree’s wood. “People can’t see the forest for the wood,” he tells me, as we peer down at the tiny tree I’ve just planted. “The only way I know to keep people from cutting down all the trees I grow is to create a market for the nuts.” He gives me a roasted ‘iliahi nut to sample. It’s tiny. And in a hopeful sign for the future, it’s delicious.